The final method for article searching is the category search. 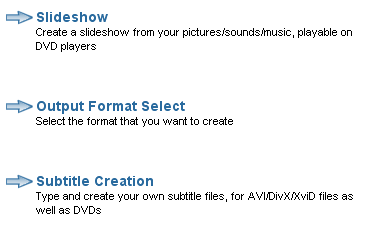 Each article/guide will belong to one or more "Main" category (such as "Play", "DV" or "Mac OS"), and one or more detailed/sub categories (these are more detailed categories, such as "DVD To AVI (DivX, XviD ...) Conversion" or "DVD Menu Creation/Editing"). You can see a list of the main categories [http://www.digital-digest.com/software/allcategory.php here]. You can see a list of the main categories [http://www.digital-digest.com/articles/allcategory.php here]. 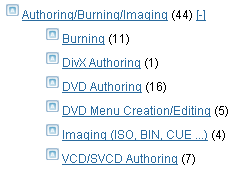 You can see a list of the detailed/sub categories [http://www.digital-digest.com/software/allcategory.php?detail=1 here]. 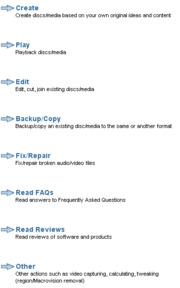 You can see a list of the detailed/sub categories [http://www.digital-digest.com/articles/allcategory.php?detail=1 here]. This page was last modified on 16 August 2007, at 06:52.